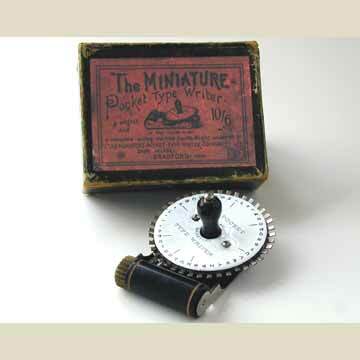 The Miniature Pocket Typewriter that hit the market for modern gadgets in Britain in 1887 is one of the smallest index typewriters that were ever produced. Less than 10 cms long and boasting a weight of 4.5 Oz (120 grams) it must have been a great salon conversation piece, equivalent to today's palmtop computer. The primitive machine was operated by placing it on a piece of paper with the enameled index to the right. The index was rotated until the desired character stood on the left. The letter was printed by pushing the index down onto the paper. The machine would then be pulled one space forward. Friction was caused by two rubber bands around the wooden roll. Rubber type was attached to the bottom of the index wheel and inking was done by a roll on the right of the machine (see picture of the bottom). The quality of writing produced with the Pocket Typewriter depended completely on the even handedness of the operator. The slightest move would cause incorrectible misalignment. A sample of the writing of the Pocket Typewriter was found on the bottom of the case (see picture) where the original owner apparently wrote his own name. The Pocket Typewriter was marketed in France as the 'Polyglotte'. It continued to be sold well into the 1890s.